Last Thursday was Mark's birthday. Levi and I had a "Levi and Grandma date" in the morning. The first thing we did was stop at the grocery store to buy a balloon to take to Grandpa's office. The assortment of balloons all ready to buy was quite sparse. We asked for help. We wanted a balloon that said "happy birthday," not "I'm sorry.."or "first birthday," etc. The clerk told us they had no helium as there was a "helium shortage." Huh? We looked at all the available balloons, and we ended up with this one. Go Dodgers! This picture was taken by my good friend, an excellent photographer. I just love the contrast of the flower on the worn gardening glove. Our son, Aaron, is an optometrist. He also loves sports. The eye group where he works is now the official vision care provider for Fresno State University athletes. So last week he was testing the vision of the football players. Someone snapped this pic, so many thanks to that person. We are so proud of him. And I feel like I can safely brag about him here because he doesn't usually read my blog anyway. If this were a blog about, oh, the obsessive study of athletics aesthetics or something like that, I'm sure he would be an avid follower. Oh wait. There is a blog about that. And he reads it every day--and has even been quoted in it. Speaking of quotes, last week after we left Grandpa's office, Levi and I made a stop at Barnes and Noble for a little snack. After a few bites, he stopped and said, "Grandma, if you drink water through your nose, does it taste like boogers?" Had any random questions in the last week? Seen any funny signs? Please share! 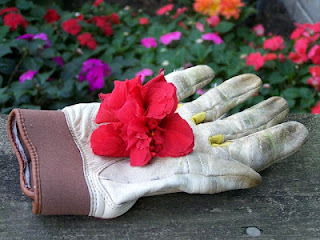 Love the garden glove picture - will make a great addition to anyone's office! No weird question yet except for my Dad's general questioning of the English language and how you say things... but I bet that as soon as the little one can speak (hopefully that should not be too soon), we will get them all! Levi asks a very good question. But I'd prefer not to find out! Levi does a lot of thinking, doesn't he? :) Cracked me up!! Happy birthday to Mark...and, yes, I knew about the helium shortage! I was driving Lula and Jane home this week when Jane started saying, "What's happening?" over and over again. Finally, in exasperation, Lula retorted, "I don't have any problems, Jane!".... Well, I thought it was funny any way as I'd never heard Lula use the word "problems" before. Happy birthday to Mark! I love that photo of the glove and flower. What talent! Have a wonderful day. Sorry my link up is a downer today! Argh. That was the most random question yet!! Kids do ask the best questions don't you think? What a cutie Levi is!!! Eli and I picked our pumpkins out of the garden this morning, I took photo's of the sunflower with 24 blossoms on it, yes, 24! and then I picked the sunbleached tomatoes and threw them away. Also got rid of the oversized armenian cucumbers and squash so more will keep coming on. :o) Now off to show our Guild's wonderful Opportunity Quilt to my horsey friends. Maybe sell some raffle tickets. It's all hand appiqued and hand quilted by our master quilters. hehehe wish I could send you a photo. I tried to add my link and something happened with the address and it didn't load right #6. Then I couldn't figure out any way for me to delete it. I tried again thinking it would replace the one that didn't link right but instead it added a new link - it does work though whew! Not sure if you can delete the bad link for me, sorry to make work for you. As usual enjoyed your random post and especially Levi's question. Oh Mark really does need a quilty make-over!! No one sees, or comments on the world quite like little boys do. Glad you got to spend time with him. Fun to get a picture of your kid while they're working. Isn't that why we train them up--now, go to school, we say, get an education then get a good job. You should coast from now on, as you've done your part! Love the others--and no, I won't use the garden glove picture, so no worries. (But it is very gardeny and wonderful).